An Indian wedding day's getting ready preparations are always so beautiful. It's the quiet before the storm, and it's absolutely one of my favorite parts of any wedding day. Most brides have professional hair and makeup artists, but every so often, a bride will want to tinker with what they've done. 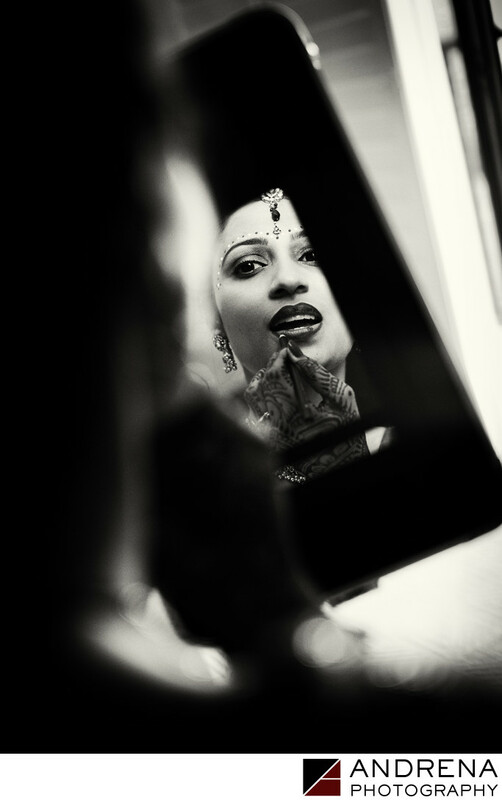 It was during one such moment that I was able to capture this lovely image of an Indian bride touching up her lipstick. Photographs like this have a true intimacy about them, and that intimacy helps create a mood that I just love. I adore black and white processing for images like this. Pacific Palms Resort has so many fun locations for photography, so I always enjoy working there. Indian wedding photographed at Pacific Palms Resort, Industry Hills, California.